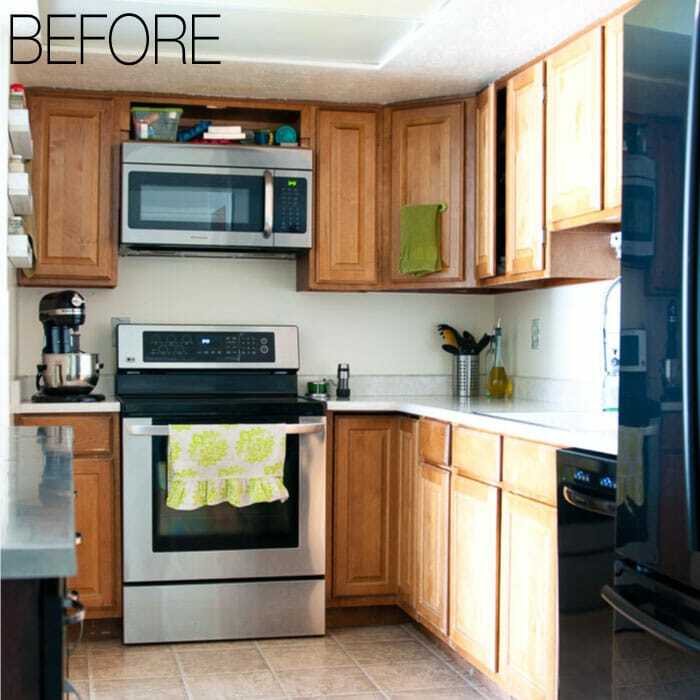 You are here: Home / Remodeling / Room Reveals / Budget Farmhouse Kitchen Remodel Reveal… Almost! 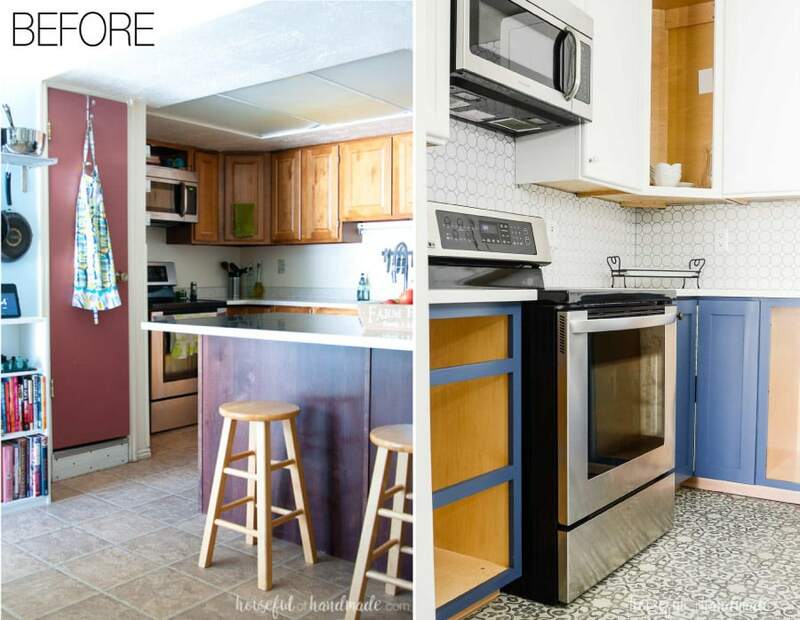 Can you transform a kitchen from dark and outdated to bright and beautiful on a budget? 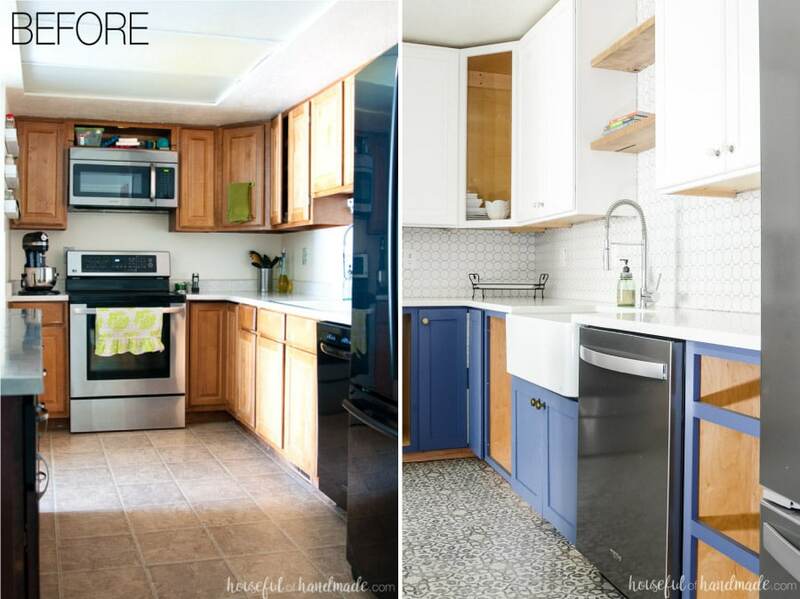 We have been hard at work on our budget farmhouse kitchen remodel and I am so excited to share what we have done. 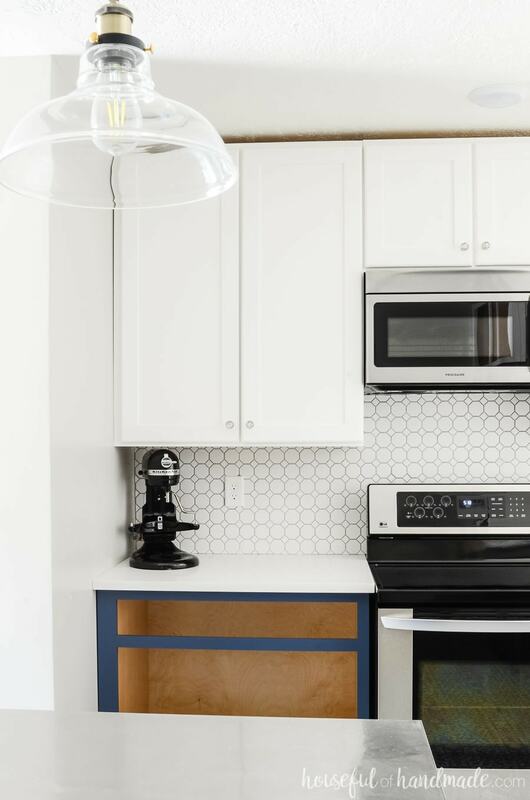 Including lots of tips & ideas to help you remodel your kitchen on a budget too. It’s been 5 weeks since we ripped out our kitchen. 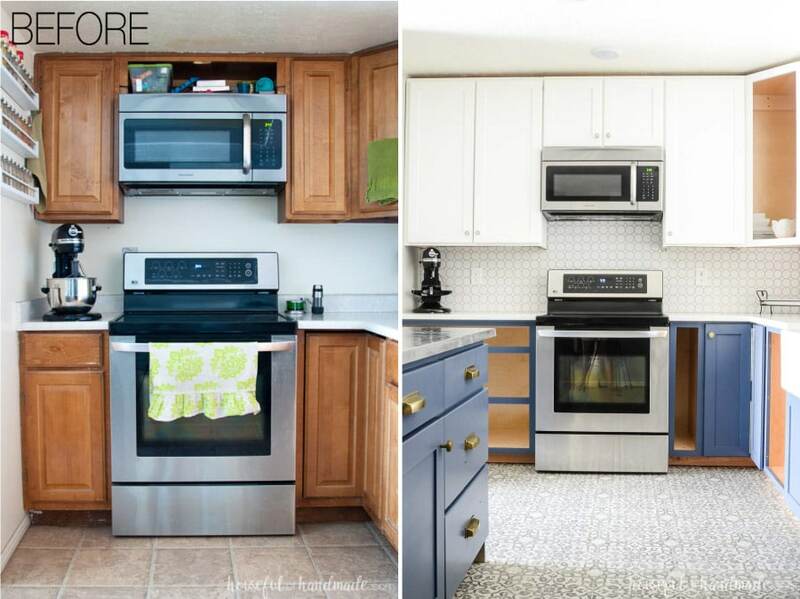 We have had a blast (mostly) pushing ourselves hard to get a complete kitchen transformation done in such a short period of time as part of the One Room Challenge™ hosted by Calling it Home. The sweet comments and love you have all shown have definitely helped to push us through when we were just dead tired! But sadly, there were just not enough hours in the day and not enough pots of coffee to allow us to finish. However, I am not letting it get me down because our budget farmhouse kitchen is mostly done and it is still super fabulous! I want to say a huge thank you to the sponsors of our One Room Challenge™ kitchen transformation. Thanks to HomeRight, Jeffrey Court, Liberty Hardware, Kreg Jig and Behr for helping us DIY the perfect kitchen. Are you ready to see? First we need to take a look back at what our kitchen looked like just 5 weeks ago. It’s almost hard to remember the oak cabinets and dropped ceiling. And don’t get me started on those small, but deep, pantries. They were black holes for anything I wanted to forget about! Now we have normal height ceilings. Eight feet have never felt so tall! And the new white cabinets go all the way up making those 8′ feel even taller. I had no idea that when we took that drop ceiling out our kitchen would feel twice as big. It’s amazing what an additional 14″ of head room can do. I swear that are counters feel deeper and my husband swears there is more space between the wall cabinets and the kitchen island. We measured. Neither is true. But it sure feels like it! Most people think I am a bit crazy for taking out not only 1 but 2 pantries from our kitchen. But both our pantries were narrow and deep. While they did store things, they also hid them very well. Once something made it to the back of one of those pantries, it was never coming back out again. Or at least until it was time for some spring cleaning. Instead now we have 1 pantry, and while it is still 30″ deep, it will also have pull out shelves so nothing vanishes to the back. By taking out those two pantries, we were able to gain 5 additional feet of counter space. We added 2 feet to the right of the sink. I never realized how amazing those 2 extra feet would be until now. Before we had our little drying rack and blender and the space was full. Now we have room for days. I could actually use this space to prepare food! The other counter space was gained around the stove. We bumped the stove 8″ to the left to make room for a pull out spice drawer (also not quite done). And then on the other side, instead of a tiny 8″ counter top that barely had room to store your spatula, we now have 35″ of counter space! It’s so big I can actually use my KitchenAid mixer here instead of always pulling it to the kitchen island. And this second pantry was used mostly to store appliances that I didn’t use too often. Things like my large crock pot, juicer, and specialty platters & cake plates. With the large cabinet above our refrigerator, I still have a spot to store those items. And they are no more annoying to retrieve then in the back of a narrow pantry. And don’t let us forget to talk about that kitchen island. We replaced our island about 3 years ago as a trade with some cabinet guys. It was a piece that was made for another job, but didn’t end up working out. The drawers were deep, the cabinets were built well, and we even had my dad install electrical outlets. So instead of replacing it, I decided to update it to match our new farmhouse kitchen. 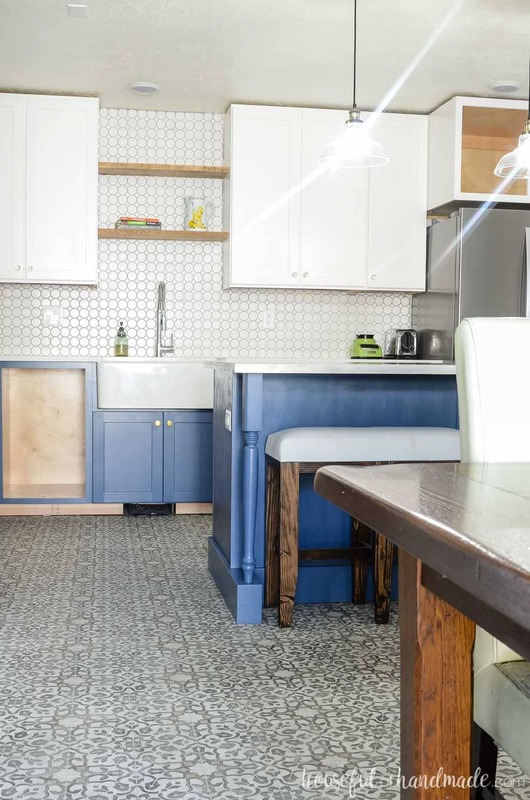 You can see all the details on our farmhouse kitchen island makeover here. I would recommend building all the cabinets before demoing the old kitchen. Maybe leave one or two until after if you are waiting on exact measurements like I was. Then you can get your kitchen back into mostly working order quickly. After the cabinet boxes are installed you can proceed with other things like flooring and countertops. Get your sink hooked up and working (such an amazing thing to have your kitchen sink back!). And then build the drawer boxes. Your drawers can also work without cabinet doors if needed. Now you have a working kitchen again, just not as pretty if you cannot shut out the mess that usually hides behind those doors. But then you can take your time building the doors and before you know it, you will have your own fantastic kitchen that you built yourself! 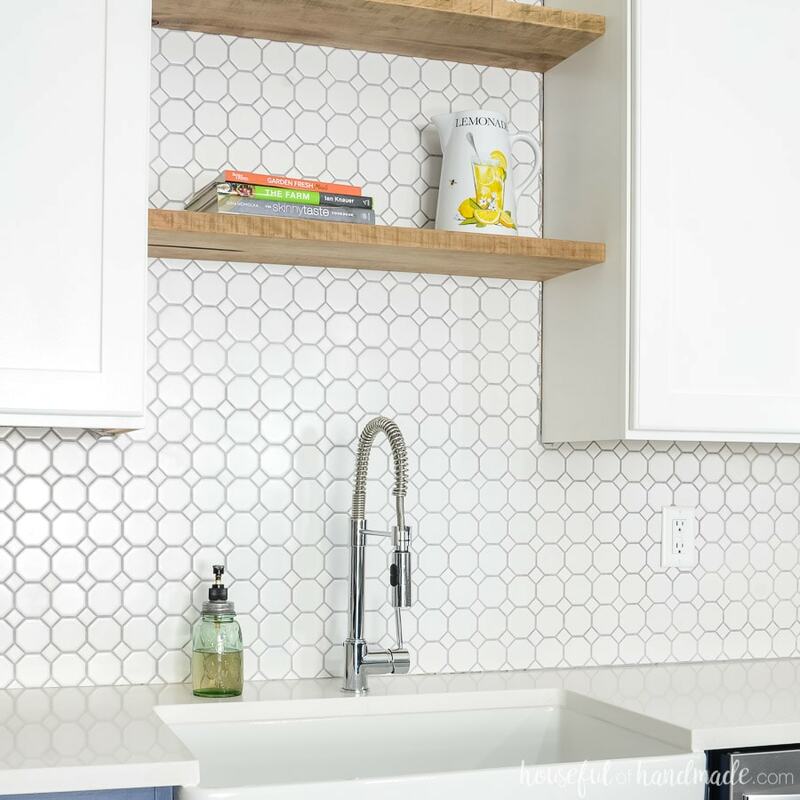 If you have ever thought about building your own kitchen, or even bathroom cabinets, I shared these resources during our kitchen remodel. And I promise to get more cabinet building posts ready to go soon. I have just been so busy working, there was not time for writing. Now I want to talk about the fun stuff. 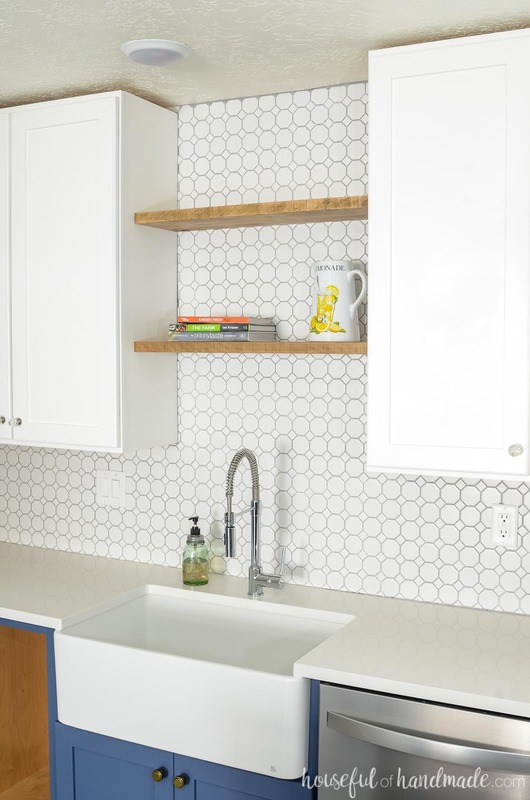 Of course kitchens need to be functional, but they also can be pretty! Or dare I say beautiful? It’s the little extras that really make a kitchen look high end, even when you are on a budget. 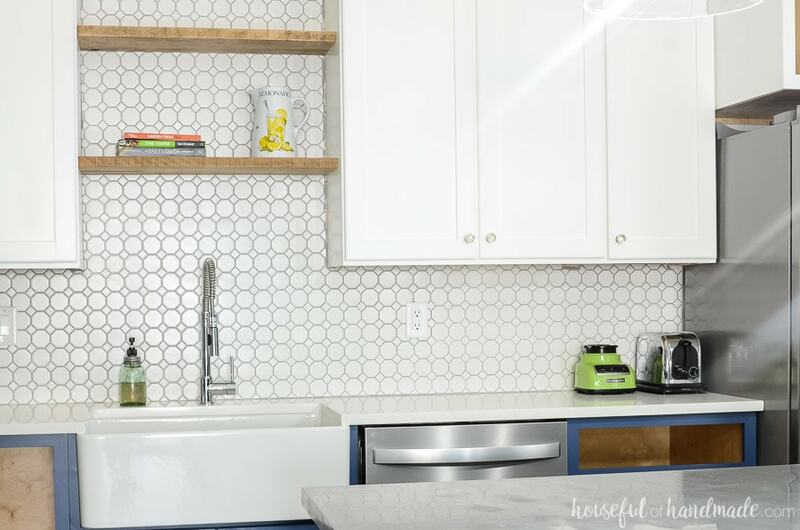 Instead of getting a 4″ backsplash installed with our quartz countertops (which I adore by the way), I opted to add a tile backsplash. 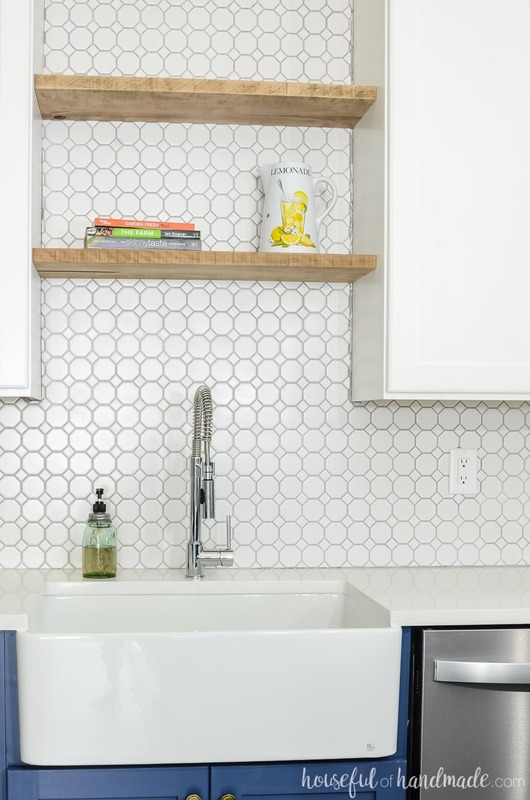 This Retro Octagon tile from Jeffrey Court can be purchased at the Home Depot. 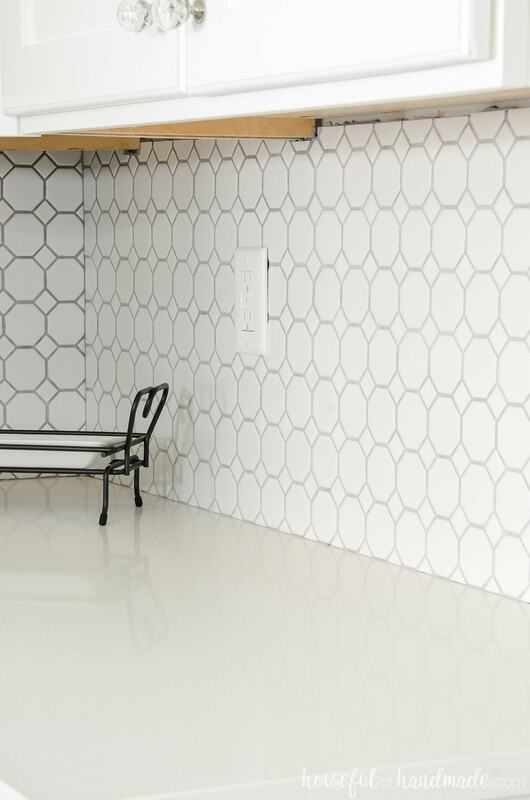 For only $220 (including grout and thin set) we were able transform the space with the beautiful tile. It makes a huge statement. And by leaving out the wall cabinet above the sink area and adding 2 rustic floating shelves, we actually saved ourselves a lot of money! I opted for 1 1/4″ thick slabs of maple for the floating shelves. The two pieces cost about $35 at the local lumber yard. Then I stained them with MinWax weathered oak stain to just give them a slight warm gray color and make the grain pop. These shelves are so gorgeous and I cannot wait to fill them up with pretty things each season. The other little extra that made a huge impact in our kitchen are the amazing knobs and pulls from Liberty Hardware. I wanted to do something a little different and use different hardware for the different colors of cabinets. I call it my interior design mullet. You know, feminine on top and party on the bottom 😉 . 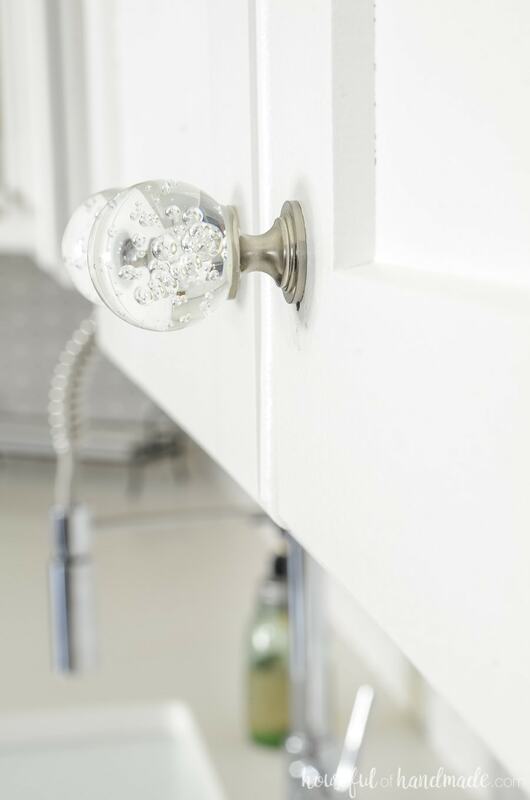 But I truly love the Bubble Glass cabinet knobs on the Behr Polar Bear white doors. They are so clean and sweet. 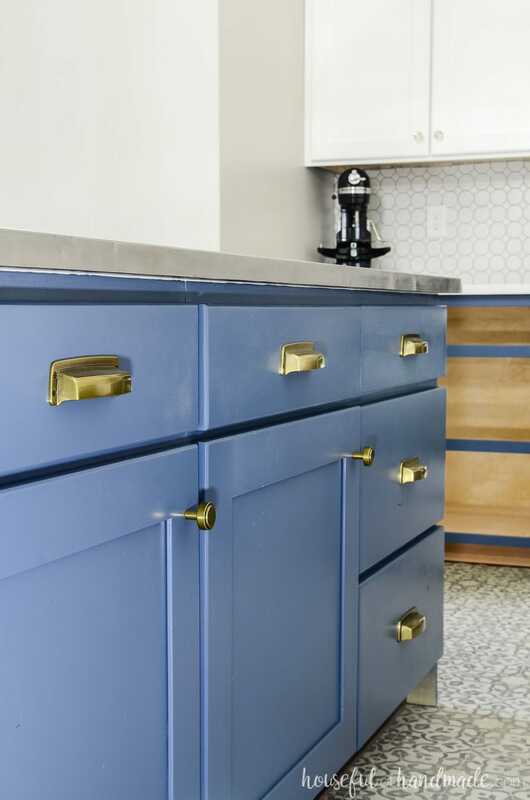 To top of the Behr Durango Blue base cabinets, I chose Soft Industrial cabinet knobs and pulls in Bedford Brass. 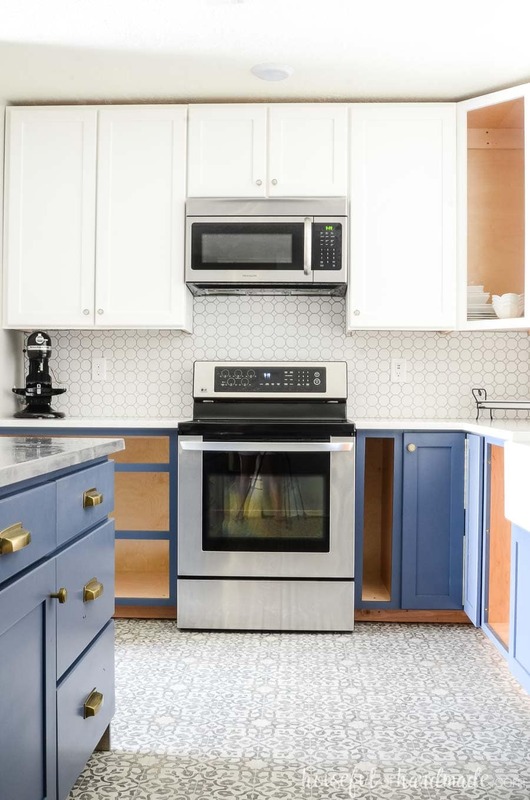 I love the antique brass color with the grayish navy cabinets. And those gorgeous drawer pulls have the best details, including faux screws on the front. I just adore them! And now let’t talk about the elephant in the room. Okay, it’s not an elephant, but a huge, single basin, apron front sink! Swoon, I’m in love. I was a little worried that the new sink was actually smaller than the old one we pulled out. But when you get rid of that center divider and add an inch or two to the depth, woozer, it give you so much space! But be warned, farmhouse sinks are not cheap! Since I knew I wanted one, and I knew I had to have a single basin one, I splurged. Then of course we learned that you also need to buy a special flange for your garbage disposal, which can cost about 1/2 the price of the actually appliance. I think this is completely ridiculous. But in the end, it was totally worth the extra dough. Now I cannot wait to bring in baskets of fresh vegetables from our garden and fill up our big, beautiful, sink. To save a bit of money, we reused our faucet. The faucet that was in kitchen when we moved in broke a few years back and I bought this new one. I still love it and knew the style would work perfect. Faucets can be pricey so it was great saving a bit of money here. We also kept our black & stainless stove and microwave from before the remodel. 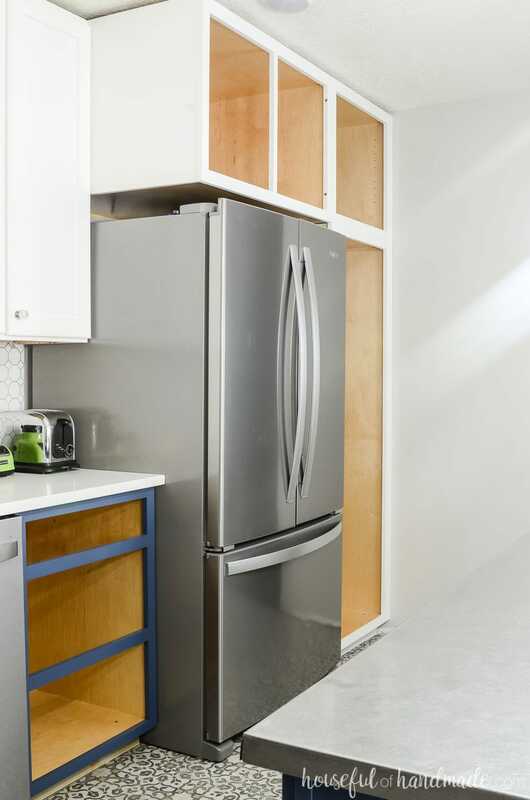 And we only updated our fridge and dishwasher to fully stainless options. Always trying to be budget conscious and since those worked great, I was happy to keep them. I could talk on and on and on about our new kitchen, but really I should be trying to unpack the piles of boxes in every other room of our house. Those beautiful new cabinets are not going to fill themselves. Then I am determined to install the drawers and finish off those other cabinet doors. Really, I have about 2 more weeks of work, including the little things like baseboards and grouting, before I can truly say our budget farmhouse kitchen remodel is done. But I think I am going to put my feet up and enjoy a glass or wine because those projects will be there tomorrow. And if I forgot anything, please let me know. My brain is getting a bit crazy with everything! Don’t forget to visit the rest of the One Room Challenge reveals today too! There are so many amazing transformation to inspire you for days. This is just SO impressive. I’m SO proud of everything you did! I can’t believe you accomplished so much in such a short time. I can’t wait to see the final reveal, I’m sure it’s going to be amazing! 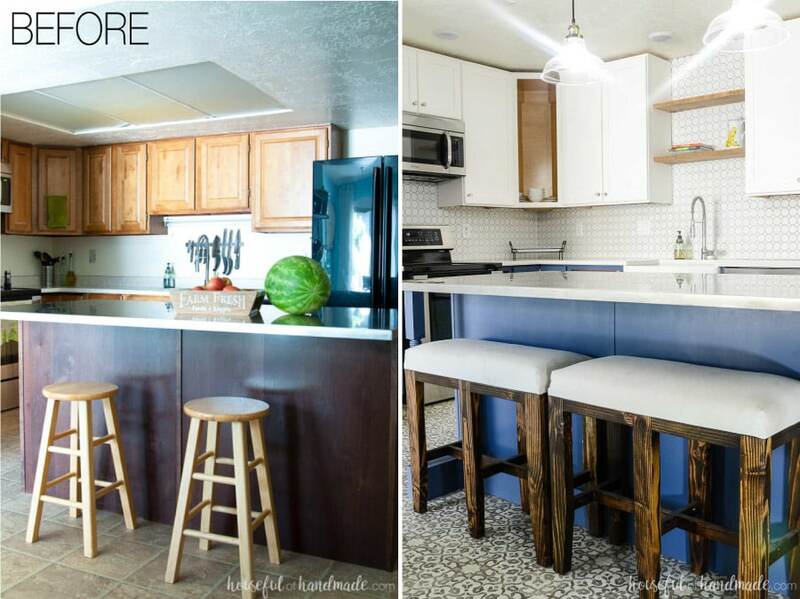 Kati – you should be so incredibly proud of this gorgeous kitchen! Your woodworking and hand-crafting skills are amazing! Love your attention to detail and design. This was a massive undertaking to accomplish in really just 5 weeks – very impressive. It’s also funny how similar in taste our color palette and finishing touches are – great minds think alike LOL. Well done friend! Thanks so much ladies! It was a big project but I am so glad I got to take it on and even more glad it’s done ;). Yes our color palettes are very similar, I adore that blue wallpaper in your bathroom! I need to be brave enough for some wallpaper now! It’s so beautiful, even unfinished! 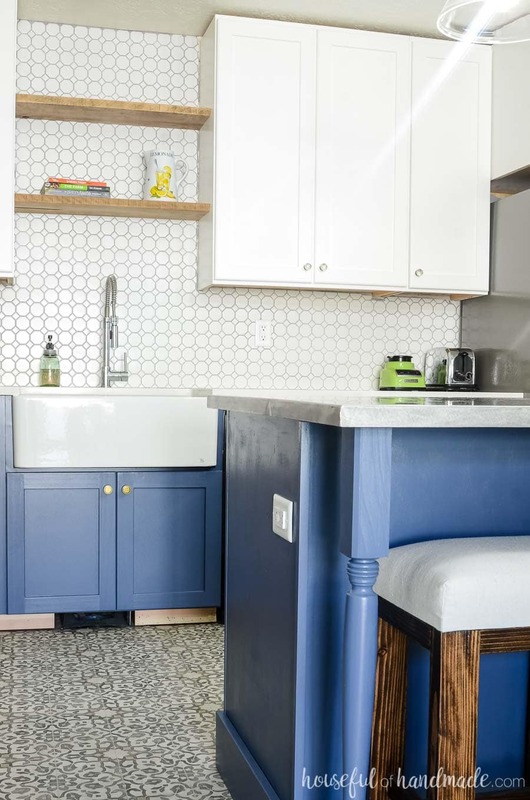 Those blue cabinets are gorgeous! Great job!!! Thanks Sheena! I have even been enjoying it unfinished. We were so ready for a home cooked meal that I just pulled boxes into the space and set to work! You did amazing Kati! You’ll enjoy this kitchen for years to come! You have done a beautiful job! I am so happy for you and your family! Kitchens are for living and yours is certainly going to add memories to your home! I want to redo mine now and you have given me just the push I needed! Mine will be paint only but you still confirmed my desire for WHITE cabinets! I have oil finished wood and they just bore the heck out of me! So look out wood even tho you are flawless I want WHITE again! Looks so much cleaner!Fantastic job and ENJOY!!!!!! Thank you so much Dolores! We are already enjoying making so many memories in our new kitchen. I would highly recommend white cabinets. They are so fresh and clean and bright! I know some people are die-hard wood lovers (and I do love wood) but I absolutely adore the white in the kitchen. I’d love to see pictures of your kitchen as you update it! Ya just made my day!!!!! I come from a family of builders and wood worshipers and have been one for my 83 years but in my kitchen I want white…light…and clean. I have had mahogany back East and since 2003 here in Tucson oil finished solid wood not quite sure but looks to me like Pecan….gorgeous! . I want to do white for my last kitchen! Thanks for your support! Now I want to see your new haven with the drawers and all else you want to finish! Enjoy….create priceless memories as ONLY a happy kitchen can do! It has always been the creme de la creme of any home we havre lived in and all my best family memories seem to start in a happy kitchen!!!! Best vibes for you and yours! Ha ha! I understand the wood worshipers, but there is a place for white paint and I definitely love it in the kitchen. We are getting close to having our kitchen totally done and ready for reveal (but have enjoyed a couple weeks of relaxing before getting back to it). I will be sure to share! And so true, the kitchen is the most important. I love spending time in here with friends and family creating memories!!! Wow! Look at all you have done! What an undertaking, and such a transformation! Looking so good. Thanks so much Sarah! It was a fun (and stressful) project!!! I’m so impressed with how much you got done in 5 weeks. Girl, you are amazing! 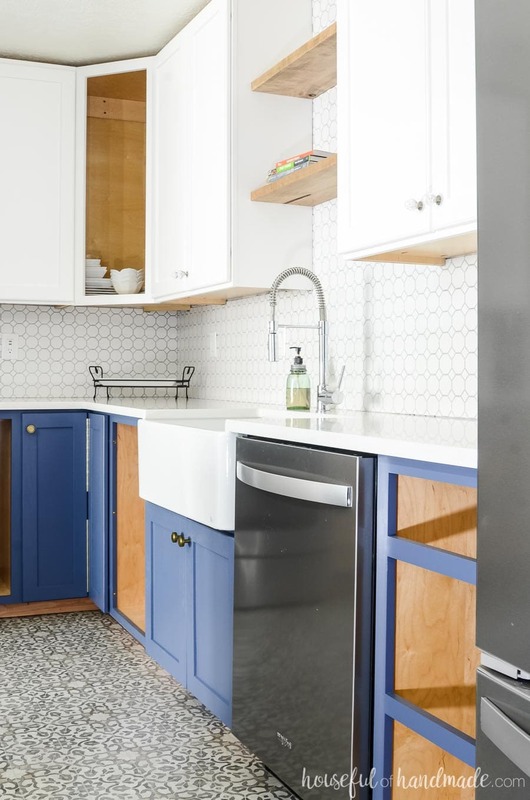 I love everything you’ve done so far but I think I am obsessed with the pulls on those blue cabinets! I’m dying! Well done girl! love the blue. My cabs are blue and I stenciled blue ivy on them. Couldn’t believe my eyes 2 yrs. later when I found a partial bolt of blue ivy fabric at a yard sale. Enough for my curtains! 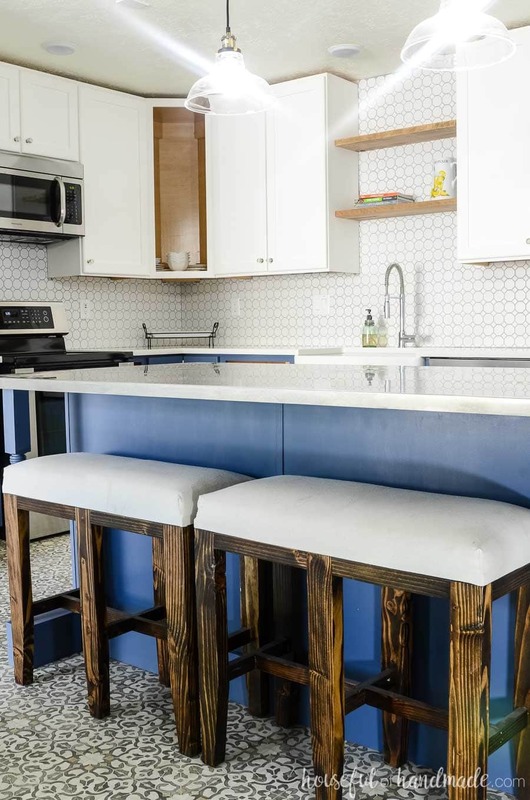 Really, really like the bar stools. Are they your design or commercial? would love the source? The blue and ivy fabric was fate! So cool. The bar stools are my design. I made them last winter, you can see the barstool benches tutorial here. You’ve accomplished so much in six weeks! I can’t believe you built all the cabinets yourself in that time. You’re amazing, and so is your kitchen! Thanks so much Vineta! I probably would not recommend someone try to build their own cabinets and doors in that timeframe, but so glad we did now that its (mostly) done! 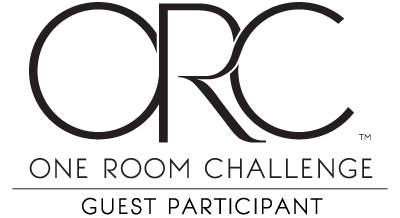 The One Room Challenge is no little project for sure! I am still tired a couple weeks later 😉 Great tile choice 😉 I love it for the floor too!